This truly traditional Italian restaurant has very quickly become the most popular eating venue in Sutton. The reasonably priced menu offers a range of Italian fare including pizzas baked in the original clay oven, pasta, meat and fish dishes – something for everyone - complemented by a very well chosen wine list. 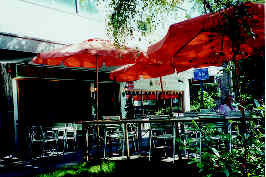 Dine al fresco in the tree shaded patio. You are welcome for simply a drink, a snack or a fulfilling meal from the a la carte menu. Open Tue-Thu 11am-3pm and 6.30-11pm, Fri-Sat all day to 11.30pm, Sun all day to 10.30pm. Closed Monday. All major credit cards accepted. 10% service charge for 3 or more diners. Select from a range of salads, pizzas, pastas, meat and fish dishes.